It was 4 a.m. when Ryan Barfield, senior animal science major, noticed the heifer he had been watching was ready to give birth. Since starting his shift at the ISU Farm in Lexington 10 hours earlier, he had a feeling that this would be the night. Now with the calf’s arrival imminent, it was his job to make sure the entrance into the world went smoothly. 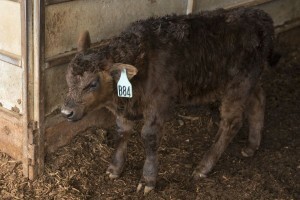 The challenge is part of Calf Watch, an independent study offered through the Department of Agriculture. Illinois State University Farm Manager Russ Derango ’77 works with students, some of whom have no experience around livestock. The importance of making sure calves are delivered without complications cannot be overstated. Justin Rickard ’04, M.S. ’08, assistant professor of animal and meat science and faculty supervisor of the ISU beef herd and meats lab, notes that it is crucial to do whatever it takes to produce live offspring. Barfield with Illinois State University Farm Manager Russ Derango. Derango prepares the 15–20 students for the challenge through an orientation that teaches safety around the farm’s 120 head of cattle, and calving basics such as helping the heifer through labor, preparing the pen for the heifer and calf, and administering vaccinations. Students can take 1–3 credit hours. Every hour earned requires staying three nights at the farm. The shifts are long, spanning from 6 p.m. to 6 a.m., covering the timeframe when farm staff are off-duty. Occasionally students are teamed together for shifts that fall every day of the week during the 60-day calving window. More often than not, students brave the long hours solo, making hourly trips to bottle-feed calves who have been rejected by their mothers while keeping an eye out for heifers going into labor. “Even if they don’t see a calf born, the idea behind the class is for them to understand the management with the cow herd. They understand what it takes to walk through the cow herds every hour to check for calving. The idea is so they start learning the signs of a cow giving birth,” Derango said. Barfield’s calf was born on his first night of Calf Watch. He began his shift checking on the heifer every hour. Then every 45 minutes as signs began to show. Eventually he just hung around the pen and observed. Finally, it was time. Barfield sprang into action and began prepping the area as he had been trained. He made sure the pens were ready and brought over the wheel barrow. He also called Derango to let him know that the heifer was giving birth. Unless assistance is requested, Derango leaves the task to the student in charge. Barfield soon saw the head was out. He knew to remove amniotic sack from the calf’s head so it could start breathing. Unfortunately, there was one thing Barfield hadn’t prepared—a knife. He needed to be quick to get the calf breathing. Derango prepares the 15–20 students for the challenge through an orientation that teaches safety around the farm’s 120 head of cattle. Barfield went to get the wheel barrow. Before he could turn around he heard the calf drop. After making sure the calf was breathing, he moved the 60-pound, slime-covered calf onto the wheel barrow and over to the isolation pen. After applying iodine to the umbilical site and giving the calf an oral administration of ecolizer, Barfield brought the heifer into the pen with her new calf. “Understanding what working with these animals means, what the treatments can or can’t be—it was definitely beneficial in understanding that side of the business. I loved my experience because it was something I could go forward and use later on,” said Barfield, who plans to enroll in veterinary school after graduating in May. For faculty, farm staff, and students, Calf Watch is a golden opportunity. Sharing this nightly vigil allows students to take away valuable hands-on experience while alleviating the demands on farm staff. “Classes of this nature may be becoming more difficult to do at larger institutions, so we are very proud of that fact that we can offer things like this to provide the level of industry relevance our students need when they go out looking for jobs,” Rickard said. I remember the long hours on the farm working with the cows and sheep were great experiences as well as met long time friends! I wouldnt had it any other way. Jason Seelow class of 2004.